"This might more properly be called Volume 1.1 in our series of anthologies, because it's not quite the same as the editions of Volume 1 that have preceded it. We took out the advertising that appeared in the original Collector's Edition and all of the subsequent printings, because the prices, the products, and sometimes even the companies have long since gone out of date. We plugged new artwork into some of the old advertising space, and we compressed the book so that it's eight pages thinner than it used be." Planes; Deserted Cities of Mars; How Green Was My Mutant; Monkish Combat in the Arena of Promotion; Some Ideas Missed in Metamorphosis Alpha; Some Thoughts on the Speed of a Lightning Bolt; Alternate Beginning for Metamorphosis Alpha; What to Do When the Dog Eats Your Dice; Hints for D&D Judges; Excerpt from an Interview with a Rust Monster; The Play's the Thing; Sturmgeschutz and Sorcery; Languages; Illusionists; The Development of Towns in D&D; Illusionist Additions; Let There Be a Method to Your Madness; Tombs & Crypts; Designing for Unique Wilderness Encounters; Halflings, Dwarves, Clerics & Thieves in DUNGEON! 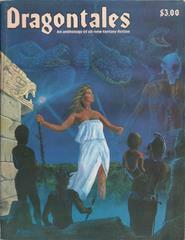 ; The Total Person in Metamorphosis Alpha; Statistics Regarding Classes: Bards; How Heavy Is My Giant; The Original Ranger Class; Notes from a Semi-successful D&D Player; Wizard Research Rules; Tolkien in DUNGEONS & DRAGONS; Witchcraft Supplement for DUNGEONS & DRAGONS; The Meaning of Law and Chaos in D&D; Solo DUNGEONS & DRAGONS Adventures; D&D Is Only as Good as the DM; Lycanthropy: The Progress of the Disease; Gary Gygax on DUNGEONS & DRAGONS; The Japanese Mythos; The DUNGEONS & DRAGONS Magic System; Random Monsters; Monster Reference Table Addition; D&D Option: Demon Generation; Miscellaneous Treasure. 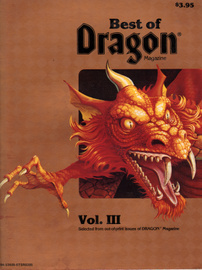 From the first four years of Dragon Magazine! 7 NPC Classes. 12 From the Sorcerer's Scroll articles. 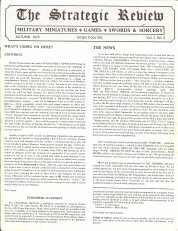 11 other articles for D&D and AD&D. ARTICLES: RACES - The dwarven point of view; The gods of the dwarves; The elven point of view; The gods of the elves; The halfling point of view; The gods of the halflings; The gnomish point of view; The gods of the gnomes; The half-orc point of view; The gods of the orcs. 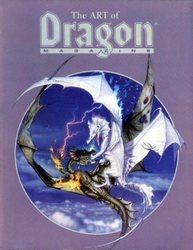 DRAGONS - That's not in the Monster Manual! ; Hatching is only the beginning; Self defense for dragons; The faerie dragon; Two tough foes; Evil dragons make good armor. CLASSES - The thief: a special look; The druid and the DM; It's not easy being good; He's got a lot to kick about (monk); Singing a new tune (bard); Cantrips: minor magic; Cantrips for the illusionist; Spell books. OTHER - The winged folk; The alchemist; The archer. ARTICLES: NPC CLASSES - The bandit; The bounty hunter; The cloistered cleric; The death master; The duelist; The jester; The scribe; The smith. PLAYERS' PERSPECTIVES - Be aware, take care; It's a material world; Finish fights; Two-fisted fighting; The whole half-ogre; Riding high. CREATIVE CAMPAIGN - Five keys to success; A PC and his money; The care of castles; Saintly standards; These are the breaks; Repair or beware; Wounds and weeds; Runes; Runestones. "From out of the eons! 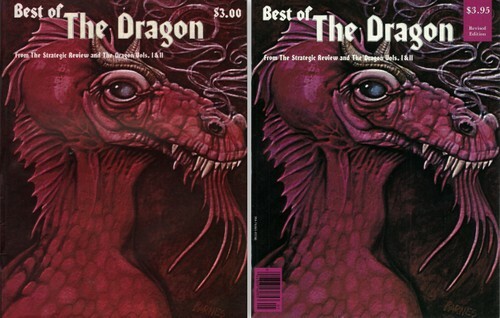 From the howling winds of the Ice Age to the silver depths of the Astral Plane, this fifth collection of the Best of DRAGON® Magazine brings ADVANCED DUNGEONS & DRAGONS® game players an assortment of adventuring articles that rank among our best ever. Barbarian cultures, guidelines for wishes, the gods and societies of the humanoids, and ruined cities are explored in detail. The Oracle NPC class foretells the future, and hardy adventurers and Dungeon Masters may venture into gunpowder-using worlds full of danger and sudden death. 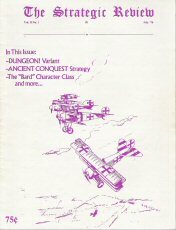 Articles are also featured on critical hits using the AD&D® game system, and the creation of instant adventures for any role-playing game. Each article has been re-edited for clarity, and the Astral Plane article contains entirely new material never before published. 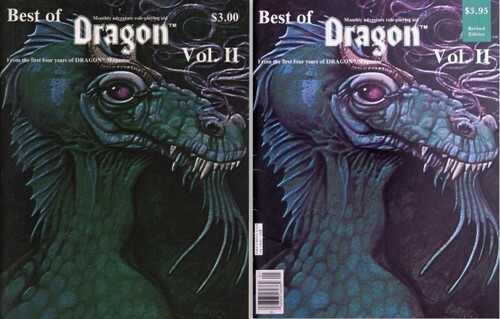 Even if you have the original issues with these articles, you'll want to get this edition of the best ever printed, from the largest and longest-lived role-playing periodical: DRAGON® Magazine! Pick up a copy — and enjoy!" 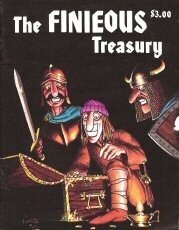 Firearms; A second volley; Instant adventures; Modern monsters (cars); How many coins in a coffer? ; What do you call a 25th-level wizard? (level titles); Ruins; Libraries; Keep 'em guessing; The real barbarians; Tarsakh showers (calendars); The humanoids; Best wishes; Magic for merchants; Spell strategy; Good hits & bad misses; The Astral Plane. Box is classic software-style, with a thin paperboard case covering an inner corrugated flip box. Inside is little other than a double jewel case containing 5 CD-ROMs. The proprietary search function is lousy and dated. 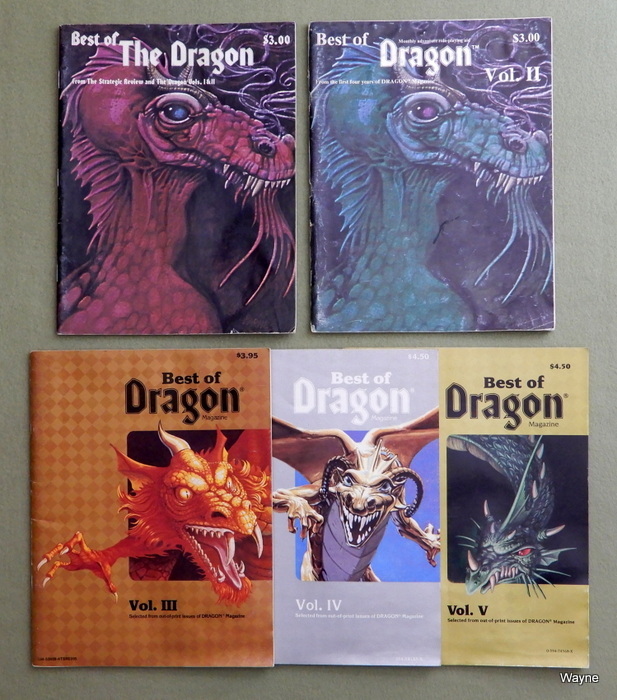 The good news is that the Dragon issues are all separate PDFs... nicely bookmarked, and can be manipulated easily as such. 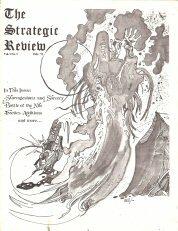 It also contains the issues from the Strategic Review. 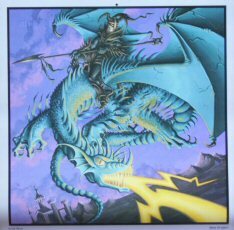 Calendar features full-page art from the artists of TSR's early days, including Larry Elmore (white dragon), Jim Holloway (crystal dragon), and Erol Otus (blue dragon). 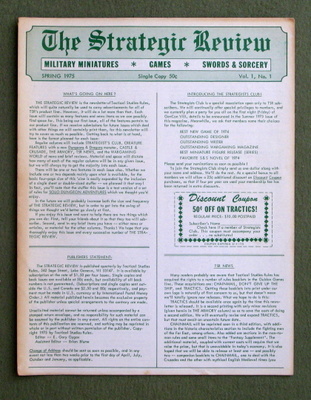 The Strategic Review was the predecessor to Dragon Magazine. 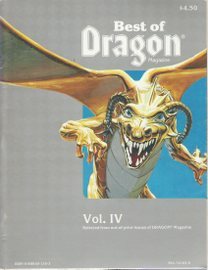 Half the articles are penned by Gygax himself. 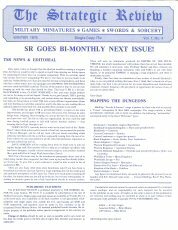 What's Going On Here; Introducing the Strategists Club; TSR News; Creature Features (Mind Flayer); Wargaming World; The Armory (Tractics); Castle & Crusade (The Spear); Solo Dungeon Adventures; Mapping It Out. 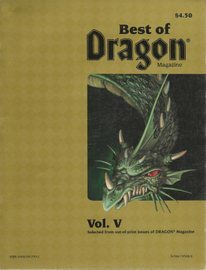 CONTENTS: Cavaliers and Roundheads Rules Additions; Wargaming World; D&D FAQ; Creature Features (1st Appearance: Roper); Ranger D&D Class (1st Appearance); Medieval Polearms (Gary Gygax); more. 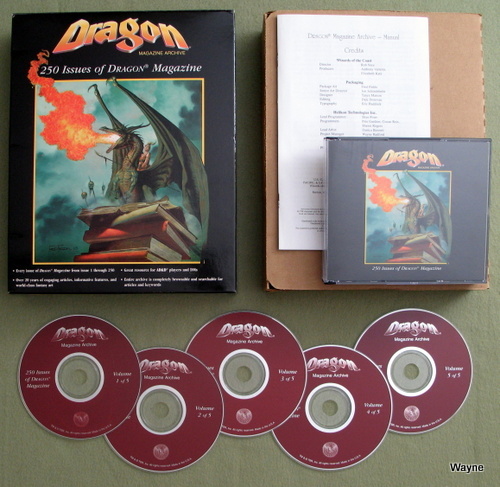 CONTENTS: Creature Features (1st Appearance: Yeti, Shambling Mound, Leprechaun, Shrieker, Ghost, Naga, Wind Walker, Piercer, Lurker Above); Monster Reference Table Addition; Battle of the Ebro River in 5mm Napoleonics; Gallery of Gunfighters - Part 1, the Art of Gunfighting; Deserted Cities of Mars (Jim Ward); more. 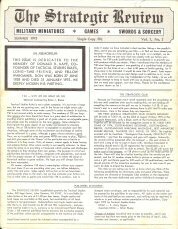 CONTENTS: Polearms (Gary Gygax); Panzer Warfare - Additional Unit Organizations; Tractics Weapon/Vehicle Gun Changes; Illusionists in D&D (Peter Aronson); Tsolyani Names Without Tears (M.A.R. Barker); Creature Features (1st Appearance: Clay Golem); Mighty Magic Miscelleny (1st Appearance: Ioun Stones); Gallery of Gunfighters (Doc Holliday); more. 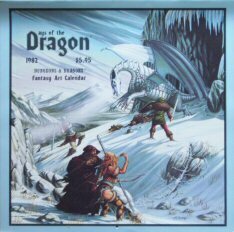 CONTENTS: Sturmgeshutz and Sorcery (Gary Gygax); Battle of the Nile (Dave Arneson); Tractics Additions; Creature Features (1st appearance: Rakshasa, Slithering Tracker, The Trapper); more. 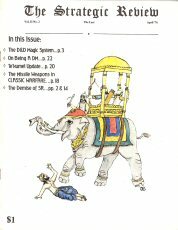 "In this Issue: * The D&D Magic System * On Being A DM * Te'kumel Update * The Missile Weapons in CLASSIC WARFARE * The Demise of SR"
Copyright © 2018, Waynes World of Books. All rights reserved.